Psalm 1 offers a simple formula for growing the substance of the soul. It describes what many people believe: If we avoid the path of sinners and immerse ourselves in God’s law day and night, we will be like trees planted by streams of water, growing, yielding fruit, prospering in all we do. Did you notice? The burden is placed squarely upon our shoulders. If we walk in the right paths, if we meditate on God’s word day and night, then we will be like trees planted by streams of water. There is truth here: We are not owed fullness of soul. The responsibility of the substance of our souls is ours. But not all the responsibility. The two parables of seeds and sowers in the Gospel of Mark, hint that other forces help grow the substance of our souls. I think you will be surprised, as I was, by what these two parables suggest about the “how-to” of faith. But first, two caveats. Many bibles break scripture into sections, and give those sections titles. But these are not in the original text. For example, our first parable in Mark is titled, the Parable of the Sower. Therefore we are more likely to interpret everything from the perspective of the Sower. But in reality, it is a parable about a sower, seed, soil variations, and different results. When Jesus added, “Let anyone with ears to hear, listen!” he meant for us to consider all aspects of the parable. people into a new way of seeing. Parables are not so much to be explained, as they are to be inhabited, lived into, and when meaning dawns they have such transformational power. So with those two caveats, let’s enter into the world of these two parables and see what we find. First of all, Jesus is not talking about agriculture. If so, he would have been laughed out of town because these two sowers are agricultural buffoons. Jesus points to our spiritual lives. In the first parable, the sower is indiscriminate, almost extravagant, in his wasteful method. He’s working up a good sweat, throwing seed with both hands, left and right, in front and behind, over his shoulder and underhanded. Maybe he makes like David slaying Goliath, with a sling-shot full of seed. Seed is tossed every which way including loose: on the path, on the rocks, in the weeds, and on good soil. There’s no place, no matter how hard, rocky, or thorn-infested, that is undeserving of this guy’s seed. At a race track, this guy would place money on every horse. After this sower has walked by, it looks like it has snowed. Then we get a report of the results of his indiscriminate sowing. Seed is snatched by birds, burned up in the sun, choked by thorns, and wildly productive. I’ll be honest. I’ve always had the impression that the harvest in this parable was measly. But if we do the math – 30, 60, or 100 fold yields for every seed that fell in good soil – this sower can afford his extravagant method. He is swimming in a sea of seeds! If only one out of every ten seeds he sows falls into good soil, he’s at worst tripling and at best yielding ten times more seed than he loses. What if God is this kind of sower? Scattering the seeds of love, grace, and peace with such reckless abandon and indiscriminate extravagance! All over the various soils and terrains of our lives, time and time again. Because there’s no place in us – no matter how hard, rocky, or thorn-infested – that is undeserving of the seed of this Sower of Love. God believes in this seed, this life of the Spirit, that when it finds some good soil in us, it will yield that much more seed to be spread all over again. And what if we were that kind of sower? Scattering seeds of love, acceptance, compassion, and justice with the same reckless abandon, and indiscriminate extravagance? Because there is no one – no matter how hard, rocky, or thorn-infested – who is undeserving of the seed of God’s love. About 15 years ago a woman came to see me in my office. She faced difficulties in her marriage, battled clinical depression, and was going through a faith crisis. She commissioned me to paint a painting for her. The instructions were simple: “Tim, paint me a painting of Hope.” How was I going to portray hope? Then it hit me – A sower, recklessly, indiscriminately, extravagantly throwing seed in a barren land. Hope is possible, because God is an agricultural buffoon, scattering seeds of grace all over the soils of our souls, so that some seed will find the good soil in us, and bear much fruit. The second parable is less familiar to us. 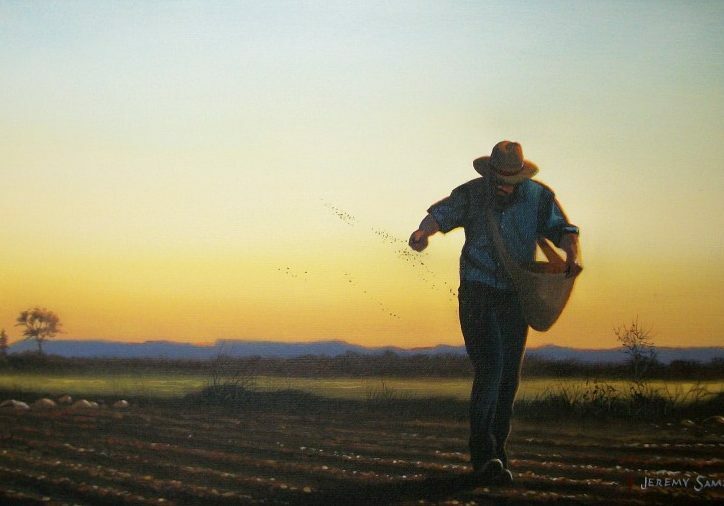 A sower scatters seed, then sleeps and rises night-and-day after night-and-day, and the seed grows he knows not how. It’s almost as if one day the sower sows, then goes about his life and is flabbergasted, amazed, mystified, and pleased at the growth he finds. The earth, the seed, produces of itself, without any help from him. Hildegard of Bingen, a 12th century mystic, composer, and theologian, describes God’s Spirit as the Greening Power of God. Just as plants are greened, we are too. At the church I served in Clayton Valley, CA, there used to be old Zinfandel vines on the property, but they had not been attended to for years. At a break during a new members class, two elders of the church walked out to the old, neglected vines and returned with a bundle of plump, deep-red, Zinfandel grapes. The earth, without our involvement, produces of itself. In this parable Jesus suggests the Kingdom of God is like the earth. It has a life and power all its own that is growing within us, we know not how. In a sense, the seed of God’s Spirit within us is like a prayer God prays. God’s prayer in us is constant, as is God’s love. Our hearts can rest in God’s loving prayer, for it grows us. Thomas Merton speaks of God’s Spirit at prayer in us this way: What is keeping us back from living lives of prayer? Perhaps we don’t really want to pray … It is a risky thing to pray, and the danger is that our very prayers get between God and us. The great thing in prayer is not to pray, but to go directly to God. If saying your prayers is an obstacle to prayer, cut it out. Let Jesus pray. Thank God Jesus is praying. Forget yourself. Enter into the prayer of Jesus. Let him pray in you. The best way to pray is: stop. Let prayer pray within you, whether you know it or not. This means a deep awareness of our true inner identity. By grace we are Christ. Our relationship with God is that of Christ to the Father in the Holy Spirit. There are no levels. Any moment you can break through into the underlying unity which is God’s gift in Christ. In this end, praise praises, thanksgiving gives thanks, Jesus prays. Openness is all. There are invitations for us in these two parables. First, to trust in the vibrancy of God’s will, God’s prayer, God’s life within us. And secondly, to trust that we are in God, as the seed is held and nurtured in the earth, in order to produce life. Earlier I quoted Dr. Lauren Artress who said that, “In essence, the task is to grow the ‘substance of the soul.’” These parables suggest that this task is not just ours alone, it is God’s task, and not just a task, it is God’s pleasure to grow us. That is what God is doing within us, even when we sleep and are unaware. Fruitfulness and growth do not rest solely upon our feverish work and attention. Knowing that God’s life within us is growing, we can pay more attention to it and learn to work with it in less feverish and more joyful ways. This is why we have hope. Even in an arid, barren soul, God continues to sow seeds of love and grace extravagantly, indiscriminately. And thirdly, this is not only true for us, it is true for everyone. This is what God is doing in the world. The Task Force for Community Engagement will help us recognize and join in with the seeds of God’s life growing in the world around us! Indiscriminately, extravagantly thrown seed, sown in the manner of the one who sowed parables the same way, fell on what looked like rocky, hard soil. But after sleeping and rising night and day, night and day, the seed of God’s grace and love sprouted and bore fruit in this woman’s life, we know not how. But God does. That’s why God sows the seeds of love and life in us so recklessly. God is growing the substance of our souls. And invites us to work alongside, night and day, first resting and trusting in God’s life praying and growing within us, then working joyfully, extravagantly throwing seed. Because there is no one – no matter how hard, rocky, or thorn-infested – who is not deserving of the seed of God’s love. And speaking of seeds that have yielded a hundred-fold, I would invite you, now, to listen to the fruit of the seeds many of you have helped to sow in Bryson Brooks as he reads his own poem.